Traveling through the extracellular matrix toward the cell, the first cell structure to run into is the plasma membrane. This is an vital element for the cell. Cells die several seconds after the plasma membrane integrity is lost. Cell membranes are physical barriers, but, as we will see later, perform many other functions. Plasma membrane separates the intracellular environment from the external one. In eukaryotes, and some prokaryotes, there are also internal membranes that form organelles, separating the interior of the organelle from the rest of the cytoplasm. Components and structure. Membranes are made up of lipids, proteins and carbohydrates. The tructure, organization, as well as physical properties of membranes, mostly rely on amphiphilic lipids, i.e., those having hydrophilic and hydrophobic parts. Lipids are arranged as a bilayer with their hydrophobic part in the middle, which is made up of fatty acid chains trying to avoid an hydrophilic environment, and their hydrophilic part in contact with water (Figure 1). All cell membranes have proteins. There are transmembrane proteins with sequences of hydrophobic amino acids located among the lipid fatty chains and two hydrophilic domains, each in one of the membrane sufaces. Proteins anchored to one monolayer of the membrane are also found, as well as others bound to lipids. Carbohydrates are not abundant in all cell membranes, particularly in intracellular membranes. The amount of carbohydrates is higher in the external monolayer of plasma membrane, where they are chemically bound to lipids and proteins. Figure 1. Drawing that shows the organization of the plasma membrane according to the fluid mosaic model of Singer and Nicolson (1972). Membranes show a lipidic bilayer structure with lateral heterogeneity. Some lipids associate to form more dense areas known as lipidic domains. In these domains, some proteins are included more frequently by electrochemical affinity. Cholesterol is located among the fatty acid chains, close to hydrophilic heads of the lipids. Transmembrane proteins communicate extracellular (upper part of the figure) and intracellular environments (lower part of the figure). Carbohydrates are found in the outer monolayer of the cell membrane forming the so-called glycocalyx. In this figure, the interactions of cell membrane molecules with cytoskeleton and with extracellular matrix are not depicted (Modified from Edidin, 2003: Nicolson, 2014). Membranes are large thin sheets. At transmission electron microscopy, transverse view of membranes show a trilaminar organization: two outer dark lines and one inner clear line. The dark lines correspond to the hydrophilic heads of membrane lipids of both monolayers, respectively, whereas the clear line corresponds to the fatty acid chains. This dark-clear-dark organization, known as the unit membrane, is found in every membrane of every cell studied so far. Membrane thickness may be from 6 to 10 nm, which means that not all membranes are equal. Figure 2. 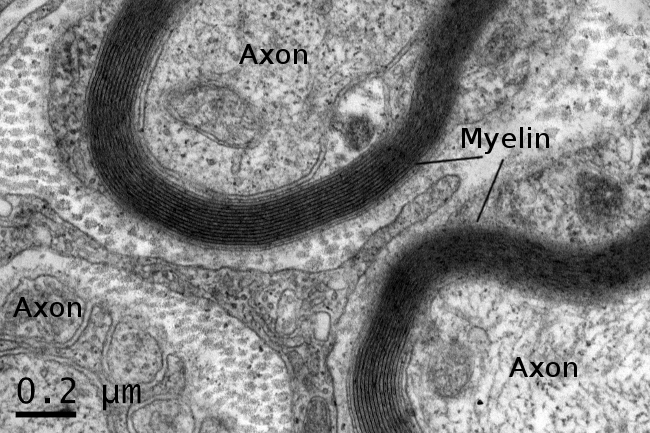 Myelin sheath in a peripheral nerve. Physiology and structure of cell membranes depend on the types and proportion of lipids, proteins and carbohydrates they contain. They change according to the cell type and membrane location. For example, plasma membrane of erythrocytes contains 50 % of lipids, 40 % of proteins and 10 % of carbohydrates. A similar composition is found in most of the plasma membranes of other cell types, with some exceptions. Myelin (Figure 2), plasma membrane of glial cells that wraps axons, is composed of 80 % of lipids and 20 % of proteins, and almost no carbohydrates. Intracellular membranes usually show a higher proportion of proteins than plasma membrane. A remarkable example is the inner mitochondrial membrane, where proteins are up to 80 %. Furthermore, lipids, proteins, and carbohydrates are diverse, and membranes do not only differ in the proportion of these three molecular groups, but also in the different types of lipids, proteins, and carbohydrates that are present. Moreover, as mentioned above, membranes are in continuous turnover. Therefore they are able to change the proportion and type of molecules to fit the particular cell physiological requirements. The physicochemical features of membranes determine their properties : a) membranes are fluid layers of lipids and proteins, allowing lateral movement and rearrangement of molecules, as if they were a viscous liquid layer; b) membranes are semipermeable, which means that they work as a selective barrier for diffusion of molecules that "want" to cross from one side to another; c) membranes are malleable and flexible, and get self-repaired after small breaks, thus recovering their integrity; d) membranes show continuous molecular turnover that enables different responses to particular physiological requirements. Depending on where they are located, membranes have different functions. They generate and maintain electro-chemical gradients used for several purposes like responding to external stimuli, transmission of information, selectively transport of molecules, and synthesize ATP. Membranes make possible intracellular compartments where specific functions are performed and form the nuclear envelope that encloses the genetic material. Many types of receptors are inserted in membranes that allow cells to "sense" molecules of the extracellular environment. Membranes also contain many enzymes for metabolic purposes. For example, cellulose and hyaluronic acid, essential molecules for plant and animal extracelular matrix, respectively, are synthesized in the plasma membrane. Furthermore, there are also phosphorylases, ATPases, lipases, and many more. The integrity of animal tissues relies on cell adhesion molecules, and cell-cell and cell-extracellular matrix adhesions relay on adhesion molecules located in the plasma membrane. In the following pages, we will deal with the main molecules, and then with membrane properties and functions. Finally, the role of membranes in the physiology of organelles will be studied, including vesicular traffic, endocytosis, exocytosis, energy production, as well as the transport of molecules across the lipid bilayer. Edidin M. 2003. Lipids on the frontier: a century of cell-membrane bilayers. 2003. Nature reviews in molecular and cell biology. 4:414-418. Nicolson GL. 2014. The fluid-mosaic model of membrane structure: still relevant to understanding the structure, function and dynamics of biological membranes after more than 40 years. Biochimica and biophysica acta. 1838:1451-1466.